Mrs. Gardiner that I have forwarded her letter to you. I hope Genl. Hunter will act promptly in the matter. deserves to lose his head. Army could go at once, but that the Navy is not ready. this attack when made will be fatal. SCHINDLER'S ANTIQUE SHOP, Est. 1921, 200 KING ST., Dial 2-0853, CHARLESTON 5, S. C.
We have a t 15.0 san excellent letter from U.S.Sec. senden who was with the Union invading forces in Flo? 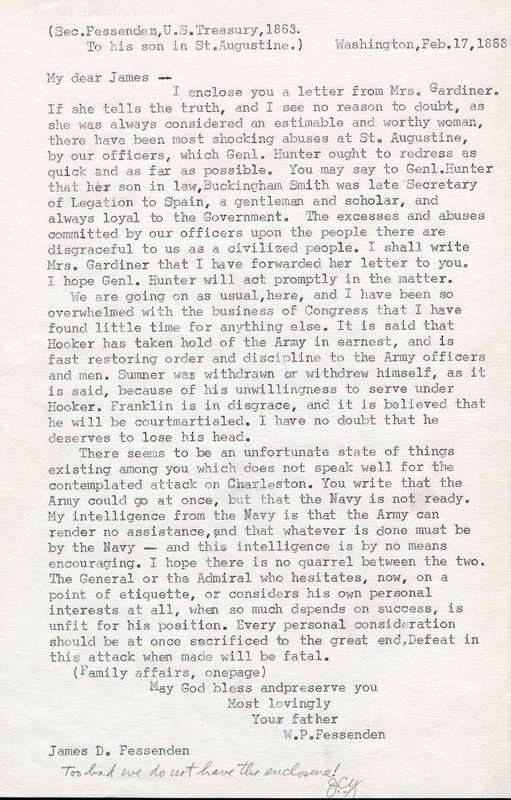 Gen.Hunterand taking steps t o have them corrected. .. . . .. ..... ... . .. .